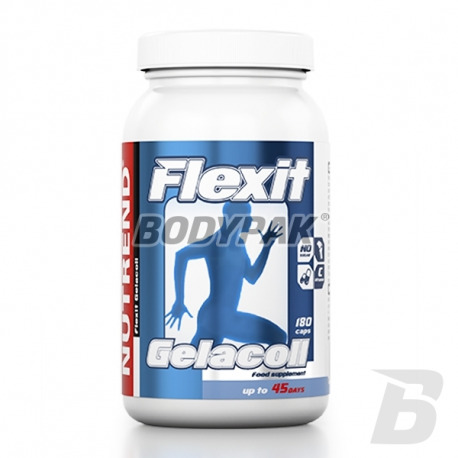 Joint HealthNutrend Flexit Gelacoll - 180 kaps. Nutrend Flexit Gelacoll - 180 kaps. Nutrend Flexit Gelacoll Caps is a highly active, high-quality gelatine hydrolyzate tablets, which nourishes and renews cartilage and ligaments, protects the joints at the physical loads, especially during sports and overweight (no sugar! ), Improves the condition of hair, skin and nails , supplements the diet with joint degenerations. Ingredients: gelatin hydrolyzate, gelatin capsule (gelatin, titanium dioxide pigment), vitamin C (L-ascorbic acid). The unique composition of glucosamine, hyaluronic acid and collagen - a set of active substances ensures efficient operation and regeneration of the musculoskeletal system as soon as possible! Top quality and good price! Flexagen ™ is an innovative composition of two forms of collagen: native type II collagen hydrolyzate, enriched with a complex of minerals: calcium and phosphorus (Calci-K ™, Albion®), manganese and copper in the form of amino acid chelates ALBION magnesium, and vitamins C, B6. Collagen Activ Plus - preparation tablets recommended for use in the prevention of disorders related to changes in connective tissue (cartilage-articular). A solid dose of MSM in each serving is one of the most important substances that have a beneficial impact on joints and their health. It supports the synthesis of proteoglycans of the articular cartilage accelerating regenerative processes. The highest world-class quality at a good price!